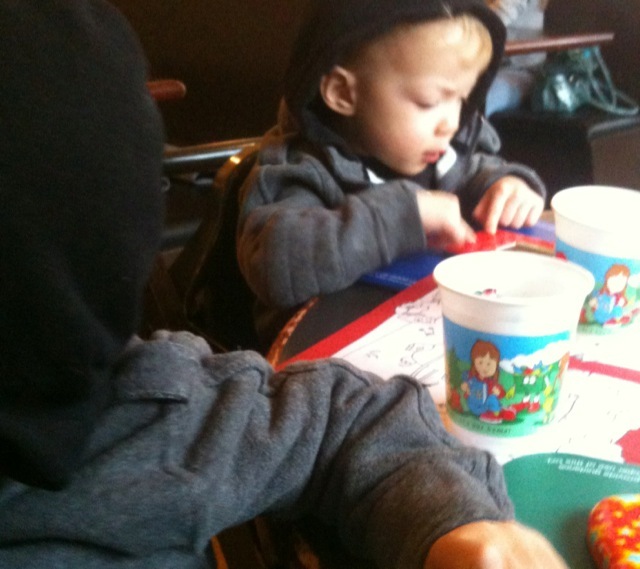 2) Order kids’ food immediately when you get to your eating place. 3) Use restaurant offered distractors first. Then pull out your own. 4) Cross fingers and hope kids food shows up soon. 1) Scope out the food and high chair situation before you pull the kiddos out of the stroller. Bring distractors with you to entertain. 2) Order and grab utensils, extra napkins, and ensure you have enough plates. 3) Set up shop near where you ordered. Put kids in high chairs (Purell, Purell, Purell) and give distractors. 4) Grab food and dish it out. Enjoy! Eating at celebration restaurants with kids. When I say celebration restaurants, I mean the fancy sort. Call ahead and make sure they are kid-friendly. No one wants a screaming baby interrupting an expensive engagement meal. If a restaurant has a kid’s meal, they’ve likely had kids there before. I generally peruse the menu online before I go, so I know what I want and what I can order for the kids. This takes the stress out of deciding, and I usually have more fun. Hopefully you’ll have a lot of extra hands when you go.